Myth: A passenger can have an open container of alcohol in Texas. Until September 1, 2001, a passenger in a vehicle in the state of Texas could legally swill an open can of beer, an uncorked bottle of wine, or an ice-cold martini, as long as they didn't share it with the driver. And until August 1987, it was actually legal for the driver to have an open container "while operating a motor vehicle." Legislation passed that year made it illegal for a driver to drink while driving. Myth: In Ann Arbor, Michigan, it is legal to turn left at a red light as long as you are turning onto a one-way street. Despite it being common practice in this college town, turning from a two-way street onto a one-way street on a red is not legal. Turning left on a red from a one-way street to a one-way street, however, is legal not only in Ann Arbor, but in the entire state of Michigan. "The reasoning is that if you're on a one-way street, there's no oncoming traffic to turn in front of," said Officer Chris Briney, police service specialist with the Ann Arbor Police Department. "A driver can safely make the turn in that situation." Certain areas prohibit the left turns on red, however. New York City prohibits them, as do the states of Connecticut, Missouri, North Carolina, Rhode Island and Vermont. In addition, drivers should never turn left on red if there is a red left-turn arrow. Myth: In Manhattan, "blocking the box" — also known as obstructing an intersection or grid-locking — carries a hefty fine, will add points to your license, and hurt your auto insurance rates. Matthew Weiss, a traffic lawyer who has practiced traffic law for almost twenty years in New York State, explains that the law was changed in 2008. 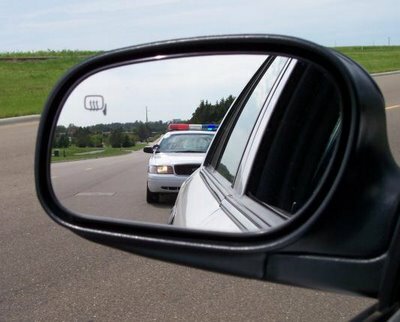 "Under the old law, blocking the box carried a $150 fine, added two points to your drivers license, and could only be awarded by a cop who witnessed the infraction. Now the same violation carries a fine of $115, but no points or adverse insurance consequences." That's the good news. But the bad news is that now that the offense is also considered a parking violation, there are almost 3,000 city enforcement agents who can issue such a citation. According to Weiss, more tickets are being issued and fewer drivers are fighting them since there are no longer points associated with the new charge. Myth: Drivers can be fined for driving too slow in the left lanes of Interstate traffic. Reality: False -- but perhaps not for long in Georgia. It's already against the law in Georgia to “drive a motor vehicle at such a slow speed as to impede the normal and reasonable movement of traffic." If it become law, however, Georgia's recently introduced "Slowpoke Bill" could also add a fine of at least $75 to this offense. "I don't think I'm alone in saying this," Rep. Mark Butler, one of the bill's sponsors, recently told the Augusta Chronicle, "but there are so many times when you're alone on a four-lane road, and people will get over in the left-hand lane, which by law is supposed to be used for passing, and will just sit there and use it as their own personal drive-out lane, and they may be going 50 miles per hour. It's slowing down traffic," he said. "It's frustrating." 5. Should You Pass On The Right? Myth: It is illegal to pass on the right. So what if you do encounter one of those slowpokes in the left lane? Should you just blow by them on the right? Go for it. As long as you have a legal and free lane open, like on a four-lane Interstate, it's usually legal to pass on the right. It's simply good driver etiquette, though, to pass on the left. States generally hold this to be the case, but certain jurisdictions stipulate that conditions must be right. For example, the New York DMV states in its rule book that drivers may pass on the right only when there is a vehicle ahead making a left turn or if you're on a one-way road that's two lanes across and there aren't any no-passing signs. Myth: It's illegal to make a turn without signaling. An officer will most likely issue a citation for such an offense. Turning without signaling is enough to get a driver pulled over. Myth: Making a U-turn at any time is illegal. U-turns can be made legally unless a sign is posted stating otherwise. Remember, as Officer Briney pointed out, every state has its own traffic laws and what may be legal in one locale may not be legal in another. "The only traffic law that I am aware of that applied nationwide was the 55-mph speed limit, and that was repealed in 1995," he said. "Otherwise, each state makes its own laws and it's up to drivers to familiarize themselves with them. As we say on the force, 'Ignorance of the law is no excuse.'"